A well-known soviet scientist, designer of aviation turboprop engines Designer General Alexander Georgiyevich Ivchenko was born in Bolshoy Tokmak town of Zaporozhye region (former Tavricheskaya Gouberniya) on November 23, 1903 in a family of worker. He went to school and spent his childhood and youth there. Alexander Georgiyevich’s family was big, there were eleven children in it. His father, Georgy Yefimovich worked as founder at Fux and Klainers plant (further renamed to Krasny Progress). His mother, Yelizaveta Yakovlevna devoted her life to family and housekeeping. In 1920 Alexander Georgiyevich started his professional activity as an apprentice in foundry, and then as founder at plant named after S.M. Kirov in Bolshoy Tokmak town. Alexander Georgiyevich has got a higher education in Kharkov Mechanical-Machine-Building Institute where, in 1935, he finished a faculty on a specialty of internal-combustion engines. After Alexander G. Ivchenko graduated from the institute he worked as an engineer on assembly and testing of aviation engines at Zaporozhye plant No. 29 named after P.I. Baranov (Motor Sich JSC now). Later he began working in the Chief Designer’s Department where he designed and improved aviation piston engines at first as a designer and then as chief of a design team. In 1938 he was appointed to a post of project designer of 1500 hp M-89 engine. That engine powered the aircraft designed by Chief Designers P.O. Sukhoy (Su-2) and V.M. Petlyakov (Pe-2A). Due to launching the M-89 engine into series production A.G. Ivchenko was appointed to a post of deputy chief of production and design bureau and continued improvement works at this engine in series production. When he returned from the Siberia where the plant was evacuated during the World War II A.G. Ivchenko was appointed to a post of head of design bureau at plant No. 29 involved in series production, and then a post of Deputy Chief Designer. Intensive works have been performed by Alexander Georgiyevich on introduction in series production of the ASh-82FN engine installed in S.A. Lavochkin’s La-5 aircraft and A.N. Tupolev’s Tu-2 bombers. In 1945 A.G. Ivchenko became Chief of the independent Experimental Design Bureau (OKB) at plant No. 478 in Zaporozhye, in 1946 he occupied a position of chief designer at plant No. 478, and in 1963 he held a post of Designer General of the State Union Experimental Design Bureau (OKB) No. 478. 1. Family of the AI-26, AI-10, AI-12, AI-14R piston aero engines to power Po-2, Yak-12, Yak-18, Yak-20, An-14 trainers, combat and liaison airplanes. 2. Family of the AI-4G, AI-26GR, AI-26V, AI-14V, AI-7, AI-24V, TV-2VK piston and gas turbine helicopter and rotorcraft engines installed in B-5, B-9, B-10, B-11, Ka-10, Ka-15, Ka-18, Ka-26, Mi-1, Mi-3, Mi-7, Mi-8, Yak-100 and Ka-22 helicopters. 3. Family of starting aero engines: TS-12F, AI-2MK, AI-8, AI-9 used in An-8, An-10, An-22, Be-12, Il-18, Tu-95, Tu-114, Yak-40 aircraft and Mi-1, Mi-6, Mi-10 helicopters, etc. 4. Family of powerful turboprop gas turbine aero engine of high service life: AI-20K, AI-20D, AI-20M, AI-24 for An-8, An-10, An-12, An-24, Il-18 passenger, transport and troop- carriers, and Be-12 hydroplane. 5. The AI-25, the first in the USSR bypass turbojet engine for Yak-40 passenger aircraft. – The AI-21 GTD for GTU-1000 gas turbine units for mobile 5E41 power stations. The turboprop airplanes powered by AI-20, AI-24 engines and turbojet airplanes with AI-25 engines are operated in many countries of the world. On November 1962 Alexander Georgiyevich Ivchenko was awarded by the CIAM’s academic council a degree of Doctor of Science (Engineering) for his scientific and research works on the development of aero engines featuring high service life. On June 1964 he became an Academician of the Academy of Sciences of the Ukrainian Soviet Socialist Republic. Alexander Georgiyevich was a great designer-scientist in the field of aero engine- manufacturing, a designer of a wide range of original designs for helicopter and aircraft engines; he was a member of the Scientific and Technical Board in the State Aviation Committee of Council of Ministers of the USSR, a member of the Scientific and Technical Board in the Main Department of Civil Aviation, a member of the Coordination Aviation Committee; he participated in studies of State projects as a member of standing commission of the State Scientific and Technical Committee on turbine power plants in the Academy of Sciences of the Ukrainian Soviet Socialist Republic. 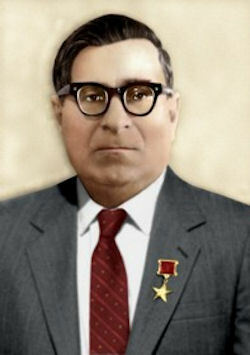 Alexander Georgiyevich Ivchenko died on July 1, 1968.